Who will miss that impressive sign board on the top of building close to the Ikejiri-Ohashi gate of the Metropolitan Expressway? Something solemn? Something mysterious? That spot seems to cast a luminous hallo and I could feel the clear wind blowing. My sensor, which has been improved with a long experience of an architectural photographer, whispered to me, "Oh, this could be a trendy power spot?" A few days later, I pretended to be a visitor and stood at the entrance of Tendo Dojo. What a noble tension there is! There must be something invisible, but to inspire me. Just after I got into the inside of Dojo, my guess turned to conviction. There must be an atmosphere I could feel in Kumano Forest or Yasukuni Shrine. Kenji Shimizu sensei is the final Uchideshi (apprenticed) to Master Ueshiba, the Aikido founder and inherits the essence of Aikido. Shimizu sensei has stately figures to cover his inner strength with his soft appearance. "You could borrow both money and knowledge from others. But, it is "the Courage" that you couldn't borrow from anyone. You should enhance it with daily discipline." Just 30 minutes after his comments, I noticed that I was standing at the edge of Dojyo wearing Hakama... . But, I don't know why I look so nice in Dogi and Hakama ??? Now, I try to get "Ki" in my daily training in Tendo-kan which is an exactly power spot to me. 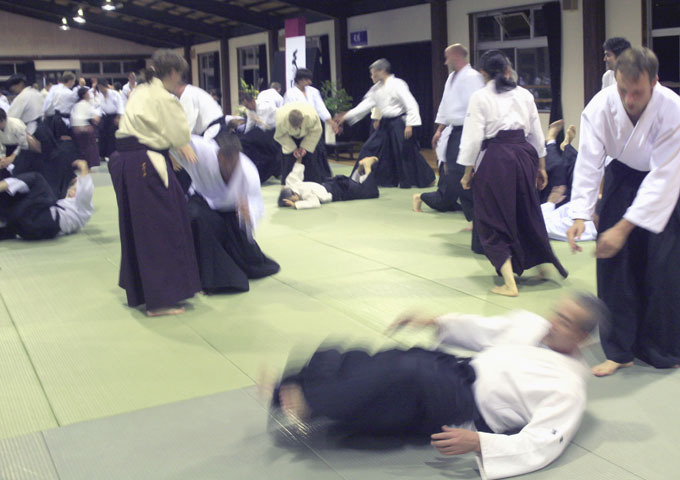 Anytime, you could hear a harmonious sound by practicing Ukemi on new Tatami mats.